The Blue Jays are about to embark upon an interesting offseason in which three key offensive producers — first baseman/DH Edwin Encarnacion, right fielder Jose Bautista, and left fielder Michael Saunders — will qualify for free agency. Their situations have been the subject of much analysis and debate, but we’ll soon begin to receive some clarity with qualifying offers due to be made (and either accepted or denied) shortly after the end of the World Series. Despite indications that the Jays are still weighing the issuance of a QO to Saunders, a rival executive tells Jon Heyman of Fan Rag that there’s “no chance” that happens. We’ll learn soon enough what direction that situation is headed in, but Saunders’s marginal second half makes the one-year, $17.2MM offer seem like a rather lofty outlay. Toronto may now be more inclined to push to retain Encarnacion than Bautista, Heyman adds, noting that the preference for the younger slugger perhaps represents a change of position from the organization. Encarnacion certainly outproduced Bautista in 2016, though that also figures to elevate his market standing. Regardless, odds are that the Blue Jays will need to compete with the rest of the league to land either player, as both are expected to decline the QO. Ultimately, the Jays have several bat-first roster spots in flux — both corner outfield positions, first base, and the DH slot. The overriding mandate, Shi Davidi of Sportsnet.ca writes, is “to get more athletic, flexible and balanced in the batting order.” There are certainly some pieces on hand to assist in that regard, including the left-handed-hitting Ezequiel Carrera and righty swingers Melvin Upton Jr. and Chris Colabello. Young switch-hitter Dalton Pompey could also factor in, though he has yet to put it all together in the upper minors. Clearly, though, there’s room for additions (or, perhaps, re-acquisitions). Toronto will be able to look to a reasonably robust market in filling these voids. According to Davidi, the club has interest in the switch-hitting Dexter Fowler, who could add a significant on-base threat to the top of the order while playing left field (and, perhaps, also stepping in from time to time for light-hitting center fielder Kevin Pillar). There’s certainly reason to believe the Jays would be well-served to add an everyday player to their lineup given the number of areas that will need to be addressed. Ian Desmond is another, quite different player who the team is expected to contact, per Davidi. Though he’s a greater home run threat than is Fowler, he’s also inconsistent in the on-base department. As Davidi notes, though, the converted shortstop could also provide some insurance against an injury to infielder Troy Tulowitzki. Alternatively, or perhaps additionally, the Jays could look at some players who are somewhat more limited and may require platoon partners. The club is said to have some interest in Josh Reddick, who hits from the left side and could be paired with Upton — though he figures to be fairly expensive for a player who ought to be limited mostly to facing right-handed pitching. Brandon Moss and even former Blue Jay Colby Rasmus could represent more budget-friendly, southpaw-swinging options, Davidi suggests. And there are a variety of other, presumably reasonably-priced players with solid offensive chops (but also plenty of limitations) who’ll be available. It’s worth bearing in mind the role that financial considerations will play in dictating the course for the Jays. The team has never reached the $140MM line in Opening Day salary, and is already approaching $120MM in 2017 commitments after accounting for a few arbitration cases and the option over reliever Jason Grilli. Those obligations fall off quite a bit in the years that follow, so backloading salary could be a possibility, but one truly significant expenditure (say, Encarnacion) or a few quality veteran additions would leave Toronto without much wiggle room to address other needs — barring, perhaps, a payroll increase. MLBTR is publishing Offseason Outlooks for all 30 teams. Click here for the other entries in this series. Since four consecutive winning seasons to begin the Petco Park era, including a pair of division championships, the Padres have had a losing record in eight of the last nine years—they won 90 games in 2010, but fell short of the playoffs after a late-season collapse—while playing very few meaningful games in a beautiful ballpark. Are there any reasons to believe that good times are ahead for this organization? General manager A.J. Preller has spent the past year digging his team out of the hole that resulted from the Padres’ premature “win-now” approach during his first offseason on the job, while also overseeing the rebuild of a team that has had very little success drafting, signing or acquiring young talent over the past couple of decades. He was also suspended 30 days by Major League Baseball for failure to disclose player medical information in trade discussions. The results of Preller’s rebuild, thus far, are promising. While the Padres are still paying a lot of money to several players who are no longer with the team, they have also shed the payroll of any long-term commitments and opened roster spots for younger players. Carlos Asuaje and Manuel Margot, both acquired from the Red Sox in last offseason’s Craig Kimbrel trade, should make an impact at the Major League level in 2017. The same goes for a handful of players who were picked up off the scrap heap and given an audition in 2016, including Ryan Buchter, Christian Friedrich, Brad Hand, Luis Sardinas and Ryan Schimpf. As for how the medical information scandal affects the team during the upcoming offseason, we can only speculate. It might have very little impact, if any at all. The trades that Preller absolutely had to make, for purposes of the rebuild, have already been made. He no longer has to sell a fellow general manager on why they should take on a high-priced player no longer in the prime of his career while giving up something of value in return. In addition, the urgency to finalize a trade is much lower in the offseason than during the season, particularly one close to the trade deadline. Medical records can be reviewed more thoroughly, and teams can utilize their own medical staff to assess the players involved. One player that Preller could have a hard time moving is catcher Derek Norris, who is expected to lose his starting job to defensive standout Austin Hedges, who also raked in the Triple-A Pacific Coast League this year. Norris finished with a slash line of .186/.255/.328, which is probably the biggest reason why Preller was unable to trade him during the season. Carrying Norris as the backup catcher is still a possibility with Christian Bethancourt potentially taking on a hybrid catcher/outfielder/relief pitcher role. However, a backup catcher making $4MM per season isn’t ideal for any small-market club, even one with a payroll as open as the Padres, and there is probably enough of a market for Preller to find a match in trade talks. Moving Norris could prove to be a challenge, but Preller should field plenty of calls from general managers interested in the team’s plethora of talented position players with multiple years of club control. Between Asuaje (2B/3B), Alex Dickerson (LF/1B), Travis Jankowski (CF/LF), Margot (CF), Wil Myers (1B/LF/RF), Hunter Renfroe (RF/LF), Schimpf (2B/3B), Yangervis Solarte (3B/2B/1B) and Cory Spangenberg (2B/3B), the Padres have nine players to fill six starting jobs (1B, 2B, 3B, CF, LF, RF). Manager Andy Green has stated that only Myers, an NL All-Star and Gold Glove finalist in his first full season as a first baseman, and Solarte (.808 OPS in 109 games) are guaranteed lineup spots next season. While they currently form the core of the Padres’ lineup, both players would likely be in high demand if the Padres were to shop them. With three years of club control remaining for each player, the price tag would be high. On a team that appears to be at least another year or two away from contending, it wouldn’t be a surprise if any players who aren’t guaranteed to be around past 2019 are dealt. Re-signing free agent Jon Jay, who the team has expressed interest in bringing back, would further increase the chances that one of the outfielders, most likely Dickerson or Jankowski, will be traded. However, a solid season by the 31-year-old, despite missing more than two months with a fractured forearm, should ensure that he’ll find an opportunity on a team who can give him a better shot at regular playing time. If there is to be a new face in the Padres’ lineup in 2017, it could be at shortstop. At the least, the 23-year-old Sardinas has put himself into the mix with a strong showing—.287/.353/.417 in 120 plate appearances—after he was acquired from the Mariners last August for cash considerations. While his struggles in the big leagues during previous stints with the Rangers, Brewers and Mariners led to his stock dropping significantly since he was a highly-touted prospect a few years ago, the Padres’ sense of urgency to find a short-term and long-term answer at the position has likely decreased. Signing Erick Aybar to a one-year deal or trading for Zack Cozart or Danny Espinosa—both are under contract for one more season—would be decent stop-gap options if the Padres aren’t sold on Sardinas. It’s also possible that the A’s would entertain offers for Marcus Semien, who hit 27 homers in 2016 and isn’t eligible for free agency until after the 2020 season, with top prospect Franklin Barreto closing in on the majors. Rangers’ infielder Jurickson Profar, with whom Preller is very familiar from his Rangers days, could be another trade target who would fill the position for 2017 and beyond. The asking price on either of those players figures to be sizable, though. Bringing back free agent utilityman Adam Rosales, who enjoyed a breakout season (.814 OPS, 13 HR in 248 plate appearances) at age 33, would give the team additional coverage at shortstop, as well as a platoon option versus left-handed pitching. While the Padres’ offense appears to be headed in the right direction, the starting rotation is full of question marks. Staff ace Tyson Ross recently underwent thoracic outlet syndrome surgery after making only one start in 2016 due to shoulder pain. The Padres are hoping he’ll be ready to go by the start of Spring Training. Even if he can return to health, there are no certainties to fill any of the remaining spots. A healthy Ross, who is eligible for free agency after the 2017 season, would likely become one of the top trade targets for contending teams if the Padres were to fall out of playoff contention. Luis Perdomo, a Rule 5 pick who went from bullpen mop-up duty to the team’s best starter in the second half, should be penciled into a rotation spot. While opposing hitters had trouble against the heavy sinker that he relied on almost exclusively, he’ll likely need to utilize his secondary pitches a bit more often in year two. Christian Friedrich and Paul Clemens each showed, on occasion, why they were once considered very good prospects. They also showed why, in their late 20s, they’ve failed to establish themselves as effective big league pitchers. Still, both likely did enough to remain on the 40-man roster throughout the offseason and will get a chance to compete for spots next spring. Jarred Cosart and Colin Rea, if he can avoid Tommy John surgery, will also compete for rotation spots, as will Cesar Vargas, who was very good in five of his seven early-season starts before being shut down with a strained flexor tendon. Michael Kelly, Dinelson Lamet and Walter Lockett, three prospects who began the season in the low minors and rose to Triple-A by season’s end, should also be in the mix. The bullpen is in much better shape than the rotation, thanks to Brandon Maurer, who settled into the closer’s role nicely after Fernando Rodney was traded (3.09 ERA, .572 opponent’s OPS, 13 saves in last 32 appearances) and talented lefties Buchter (2.86 ERA, 11.1 K/9, 20 holds) and Hand (2.92 ERA, 11.2 K/9, 21 holds). There’s a chance that Hand could move to the rotation—2016 was his first season working exclusively as a reliever—but Maurer’s failed attempt last spring, followed by a very shaky early-season performance once he returned to the bullpen, could have an affect on that decision. A return to health from Carter Capps, who was acquired from the Marlins in the Andrew Cashner trade, could boost this group to an elite level. Prior to an elbow injury late in the 2015 season that eventually required Tommy John surgery last March, the 26-year-old right-hander had begun to establish himself as one of the most dominant relief pitchers in the game (1.16 ERA, 2.0 BB/9, 16.8 K/9 in 30 appearances). He’s expected to return early in the 2017 season, if not by Opening Day, and could push Maurer for the closer’s job at some point. Phil Maton, a 20th-round draftee in 2015, is rising quickly through the system and could find himself in the Padres’ bullpen sometime in 2017. In 38 appearances between Low-A, High-A and Triple-A, the right-hander posted a 1.74 ERA with 1.9 BB/9 and 13.6 K/9. He’s also been quite effective in the Arizona Fall League, allowing only one run on four hits with no walks and eight strikeouts over seven innings. As is the case with many teams, starting pitching will be the Padres’ top priority this offseason. It’s a safe bet, however, that they won’t be in the bidding for top free agent starters Rich Hill, Jeremy Hellickson or Ivan Nova. Instead, they’ll probably look to add at least two starting pitchers from a long list of free agents with diminished value or via the trade market, utilizing their position player depth as trade chips. It wouldn’t be a surprise if one of Edwin Jackson or Clayton Richard returned. At times, Jackson looked like the pitcher that the Cubs signed for $52MM before the 2013 season. Other times, he resembled the pitcher they released with a year-and-a-half remaining on the deal. Richard, one of the team’s most reliable starting pitchers several years ago before injuries derailed his career, was particularly impressive with a 2.41 ERA in nine starts after the Padres picked him up late in the season. While Petco Park is not nearly as pitcher-friendly as it was during his first stint with the team, the 33-year-old lefty appears very comfortable there. San Diego has always been a preferred choice for pitchers looking to rebuild value, although the weather and the opportunity to pitch at the top of the rotation are the Padres’ strongest selling points these days. The return of 2007 Cy Young award winner Jake Peavy would make sense, as would the signing of Jorge De La Rosa, an NL West veteran with a career 3.22 ERA at Petco Park. Both are former staff aces and, despite disappointing seasons, finished the year in good health and could be anxious to prove that they still have something left in the tank in their mid-30s. The Padres could take a step forward in 2017 with Margot, Myers and Renfroe leading the offense and Capps, Maurer and Buchter closing the door on opponents late in the game. How much of a step forward will depend on their yet-to-be-determined starting rotation. Free-agent outfielder Colby Rasmus underwent a pair of surgical procedures on Oct. 18, reports Sportsnet’s Shi Davidi — one to shave down a bone spur and to repair the labrum in his left hip and another to repair a core muscle. Certainly, those procedures and Rasmus’ progress will be focal points in conversations between Rasmus’ agents at Excel Sports and interested teams this winter. Davidi writes that Rasmus is projected to be running at full strength come January and is currently on target to be healthy for Spring Training. Rasmus, who turned 30 in August, had a nice first year with the Astros in 2015 when he hit .238/.314/.475 with a career-high 25 home runs. That season prompted the ’Stros to make a one-year, $15.8MM qualifying offer, which Rasmus elected to accept, thereby becoming the first player in Major League history to accept a QO. However, Rasmus was plagued by injuries throughout the season (he also missed more than a month after having a cyst removed from his ear) and ultimately finished with just a .206/.286/.355 batting line and 15 homers in 107 games. Between that lack of production and the aforementioned operations, his stock has taken a fairly notable hit over the past 12 months. Rasmus did, however, play terrific defense in left field this year; he’s one of three Gold Glove finalists among AL left fielders this season and finished the year with outstanding marks from Defensive Runs Saved (+14) and Ultimate Zone Rating (+11.3) in just 672 innings. Rasmus also logged time in center field and right field, drawing positive ratings at each of those positions from both metrics as well. Overall, he racked up a career-high 13 outfield assists despite logging the second-fewest number of innings he’s ever tallied in a single season at the Major League level. Astros general manager Jeff Luhnow implied after the season that a reunion with Rasmus was unlikely, telling reporters at the end-of-season press conference that Rasmus, “…did not have the year he was hoping to have following up a pretty successful campaign last year. He still has value to Major League teams and I’m sure he’ll have an opportunity to sign somewhere, but we’re not sure how or if he fits into our plans at this point. It’s something we’re going to have to talk about as a group as we make some decisions looking forward.” Davidi, perhaps unsurprisingly, characterizes a return to the Blue Jays as “unlikely” for Rasmus as well. However, there figures to be no shortage of clubs on the lookout for outfield help this winter, and Rasmus’ ability to contribute quality defense even in the midst of some notable injuries as well as his history of 20- to 25-homer pop should indeed generate interest in him on the open market. The Brewers announced that utilityman Jake Elmore has elected free agency after rejecting an outright assignment last week. The 29-year-old Elmore logged 99 plate appearances with the Brew Crew this past season, hitting .218/.371/.244. While five of Elmore’s free passes drawn did come when he was hitting eighth in front of the pitcher, he does have a solid 10 percent walk rate for his career and has shown discipline even with another position player hitting behind him in the order. Despite that fact, though, he’s just a .215/.297/.280 hitter in 478 Major League plate appearances. His greatest asset may be his defensive versatility, as Elmore has played every position on the diamond — including pitching — in his big league career. According to Baseball America’s Matt Eddy, veteran outfielder Matt Tuiasosopo has re-upped with the Braves on a minor league contract. The 30-year-old Tuiasosopo made a brief appearance on Atlanta’s big league roster this season and picked up three hitless plate appearances before being designated for assignment and landing back in Triple-A Gwinnett. In 248 plate appearances with Gwinnett this season, Tuiasosopo batted .246/.351/.483 with 11 homers and 17 doubles. That padded his career .247/.353/.418 line at the Triple-A level, which he’s amassed over parts of nine seasons. However, the former third-rounder (Mariners, 2004) has managed just a .206/.288/.353 line in 404 PAs across parts of five Major League seasons. Neshek, 36, has a $6.5MM club option on his deal that comes with a $500K buyout. He’s coming off a 3.06 ERA with 8.2 K/9, 2.1 BB/9 and a 33.3 percent ground-ball rate in 47 innings out of the Houston bullpen this season — solid across-the-board numbers that are largely similar to the numbers he posted during his first season with the Astros in 2015. However, Neshek’s role was diminished in 2016, as manager A.J. Hinch frequently shielded him from facing left-handed opponents. Hinch’s reasoning is easy to see; Neshek has held opposing right-handers to a woeful .193/.235/.336 batting line across the past two seasons, but lefties have knocked him around at a .256/.328/.516 clip. The problem was more glaring in 2016, when lefties had little trouble squaring up against Neshek’s sidearm delivery and slashed .250/.321/.646 against him. Neshek faced 130 right-handed batters and just 55 lefties in 2016, so he’s probably looked at as more of a righty specialist by many clubs, though he did hold left-handed opponents to a .541 OPS as recently as 2014. Getting him at one year and $6.5MM may be more preferable to some teams than exploring the free-agent market and issuing a multi-year deal to one of the many setup men available. Rodney, who will turn 40 next March, has a more affordable $4.5MM club option but is coming off a worse season on the mound. The veteran righty opened the year as the Padres’ closer and posted a preposterous 0.31 ERA through his first 28 2/3 innings with San Diego. Along the way, he averaged 10.4 K/9 and 3.8 BB/9 to go along with an enormous 59 percent ground-ball rate, but his season crumbled upon being traded to the Marlins. Rodney still averaged 10 strikeouts per nine innings and posted a solid-but-diminished 52 percent ground-ball rate in Miami, but his BB/9 rate spiked to 6.8 and he was tagged for a 5.89 ERA in 36 2/3 innings with the Fish. There’s a $400K buyout on his option that the Marlins would pay him if they’re unable to find a trade partner. Barry Jackson of the Miami Herald has recently reported that the Marlins don’t have any intentions of exercising the option, so if another club values Rodney at $4.5MM on a one-year commitment, they could probably have him for a minimal cost. As for Ruiz, the 37-year-old (38 in January) spent his entire career with the Phillies before an August trade saw him trade in his red pinstripes for Dodger blue. His contract contains a $4.5MM option for the 2017 season that comes with a $500K buyout for the Dodgers. While he didn’t have a great season at the plate, Ruiz did bat a very respectable .264/.365/.348 with three homers in 233 plate appearances. He also threw out an NL-best 42 percent of opposing base-stealers, though Baseball Prospectus wasn’t much of a fan of his work when it came to framing pitches. Nonetheless, Ruiz is revered as a clubhouse presence and for his work with pitchers, and he hit .271/.407/.386 against lefties this year, suggesting that he could be plenty effective as a backup who sees many of his starts against opposing southpaws. A one-year commitment at $4.5MM is hardly an exorbitant commitment, though it might be a bit steeper than many clubs would prefer to pay for a backup catcher. As explained here, Matt Swartz and MLB Trade Rumors have developed an accurate model to project arbitration salaries. This is the sixth year we’ve done these projections, and I’m proud to present the results for 2017. The number in parentheses next to each player is his Major League service time (Years.Days) through 2016 (172 days constitutes a full year of Major League service, per the collective bargaining agreement). The Super Two cutoff will be 2.131. Service time data in this post is now official. The official MLB minimum is not yet known, but we’re using $508K. If you see any inaccuracies or have questions, please leave a comment or contact us. I should note that we are creating subjective projections for Jose Abreu and Yasiel Puig, outside of the arbitration model, given those players’ existing MLB contracts and the related intricacies. A full post on Abreu can be found here. It’s always interesting to see who is tabbed as the game’s next great prospect. Some make it, others don’t, but the number one prospect tag remains a nice prize for a pre-MLB player. There’s no clear candidate for that lofty position heading into the 2017 season, so it’s particularly interesting to see where the MLBTR readership sees things heading. Prospect eligibility is an essentially arbitrary matter, but we’ll draw the line at 100 plate appearances or 50 innings pitched. That takes players like Trea Turner, Andrew Benintendi, Julio Urias, Dansby Swanson, Alex Bregman, Orlando Arcia, Joey Gallo, Jose Berrios, and David Dahl out of consideration for our purposes. Many or all of them have largely earned MLB spots for 2017 regardless. As a guide in putting together a list of candidates, I’ve drawn from the most recent rankings of MLB.com, Baseball America, and Baseball Prospectus. There’s a range of opinion, and they also haven’t been updated to reflect late-season observations. Yoan Moncada, INF, Red Sox — Moncada has all the tools, and had a highly impressive year in the minors in 2016. He draws walks, but also has plenty of swing and miss — which was on display in his brief MLB cameo (12 strikeouts in 20 plate appearances). J.P. Crawford, SS, Phillies — A premium defender at shortstop and reputedly polished hitter, Crawford holds out the promise of being an everyday mainstay in Philly even though he doesn’t figure to post massive home run or stolen base tallies. Crawford still needs to master Triple-A and is coming off of a minor knee surgery. Lucas Giolito, SP, Nationals — There have been some ups and downs for the big righty, who struggled rather notably in 21 1/3 major league frames last year. But he’s just 22, turned in 115 1/3 innings of 2.97 ERA pitching with 9.1 K/9 and 3.4 BB/9 in the minors last year, and has the kind of arsenal that leaves prospect hounds tabbing him for a limitless ceiling. Brendan Rodgers, SS, Rockies — The least-experienced players in this stratosphere, Rodgers showed immense potential at the Class A level last year in his first full season of pro ball. The 20-year-old slashed .281/.342/.480 with 19 home runs over 491 plate appearances. Alex Reyes, SP, Cardinals — Reyes didn’t produce great results at Triple-A last year, continuing to mix high strikeout rates with high walk rates, but exploded in 46 MLB frames. He continued to show questionable command, but racked up 52 strikeouts and allowed just eight earned runs on 33 hits. Tyler Glasnow, SP, Pirates — Another power starter whose command is the major question, Glasnow was unhittable in the upper minors (69 knocks in 116 2/3 innings). He showed both the good and the bad in 23 1/3 big league innings, with 11 earned runs crossing and a 24:13 K/BB ratio. Austin Meadows, OF, Pirates — The 21-year-old stalled out a bit at the highest level of the minors after dominating at Double-A, but delivered 48 extra-base hits over 352 plate appearances on the year. Just 21 years old, Meadows could soon push the Bucs to make some difficult decisions in their outfield. Amed Rosario, SS, Mets — Rosario reached Double-A in the middle of 2016 at just 20 years of age, and delivered a .341/.392/.481 slash over 237 plate appearances — though his .433 BABIP indicated both hard contact and some good fortune. Like Crawford, he probably won’t ever wow with counting stats, but projects as a strong defender at a premium position who can provide useful offensive production when he reaches the majors. Victor Robles, OF, Nationals — Just 19, Robles is considered a true five-tool prospect with the makeup to match. He has shot up prospect charts while climbing the system, though a hand injury slowed him and he cooled off at the High-A level. While his upside is tremendous, Robles still has yet to grow into his power potential and has yet to face polished pitching in the upper minors. Other — There are a host of others who could conceivably enter the discussion. Brewers outfielder Lewis Brinson has a monster ceiling, Braves infielder Ozzie Albies could provide immense all-around value, and Padres righty Anderson Espinoza has shown huge gifts for his age — just to name a few. It feels wrong — not only in a moral and emotional sense, but also in pure baseball terms — to suggest that the Marlins can or should try to replace dearly departed ace Jose Fernandez. His sobering loss leaves gaping voids in the game writ large; in the Marlins organization, generally; and in the team’s pitching staff — none of which can be filled. 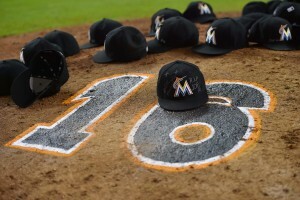 Fernandez was the beating heart of the Miami franchise, its best and most passionate player. We may never truly be able to take full stock of the effects of his death — not just on the organization, but also on the Miami and broader baseball communities — but the heartrending reaction of the organization in its aftermath suggests that they will be profound. From a roster perspective, the loss of Fernandez is mercilessly easy to assess: the Marlins had one of the most valuable pitchers in baseball. Now, they don’t. Teams wait for decades to unearth a single player of his talents in the draft. Without Fernandez racking up strikeouts at a prodigious rate, while earning a bargain salary during his arbitration years, the Marlins look like a decidedly less promising team. The team already had plenty of limitations, and plenty of needs, when looking ahead to 2017. Coming into 2016, the Fish carried an Opening Day payroll of just over $74MM — second only in franchise history to the ill-fated, $100MM+ 2012 roster. Once guaranteed salaries and the approximate arb obligations are tallied, Miami already has about $70MM committed for the season to come. While some payroll increases are anticipated, it would require a rather significant step northward to accomodate the addition of multiple quality veterans. Trades are always possible, of course, but Miami is short in prospect capital. The organization already parted with top first base prospect Josh Naylor, as well as bounceback-candidate MLB pitchers Jarred Cosart and Carter Capps, in the failed deal to acquire rental starter Andrew Cashner. The Marlins did recover youngster Luis Castillo after unwinding the portion of that trade involving injured starter Colin Rea, so he could again be cashed in. Fellow young starters like Jarlin Garcia, recent first-round draft pick Braxton Garrett, and the TJ-recovering Tyler Kolek, could all be flipped. But the Fish will need to be judicious in parting with young arms after shipping out pitchers like Anthony DeSclafani and Andrew Heaney in recent years. Corner infielder Brian Anderson has shown promise and is nearing major league readiness, so he’s another asset that could hold appeal. Miami did take steps forward in the win-loss department last year, and the team does feature a talented core even without its young ace. But there are many areas in need of improvement if the club hopes to return to the postseason for the first time since a 2003 World Series run. Catching the Nationals and Mets would be no small feat. Giancarlo Stanton, Christian Yelich, and Marcell Ozuna make up one of the very best young, controlled outfield units in baseball. Most of the infield mix is settled, too. Second baseman Dee Gordon will look to bounce back from a suspension-marred 2016, and the club will hope that double-play partner Adeiny Hechavarria can at least return to hitting at a near-average rate while continuing to provide quality glovework at short. (There has been some chatter that the team would consider dealing Hechavarria for starting pitching, but he may not have enough value and the team doesn’t really have an alternative barring a surprise move of Gordon back to short.) The Marlins kept veteran third baseman Martin Prado off the market by inking a reasonable, but hardly bargain-priced extension in September. At first, Justin Bour has continued to provide power and a strong overall batting line against right-handed pitching, though he’s in need of a platoon partner. And behind the plate, J.T. Realmuto turned in a strong campaign and looks to be one of the better young catchers in the game. The supporting cast could use some work, but the Marlins can fill out those ranks with the kinds of cheap, veteran additions the team has pursued in recent years. The venerable Ichiro Suzuki will return in the fourth outfielder’s role. Chris Johnson didn’t perform well as the right-handed-hitting complement to Bour, so Miami will look into a market that includes options such as Steve Pearce, Dae-ho Lee, and Ryan Raburn. The light-hitting Miguel Rojas remains on hand as an affordable utility option, though perhaps the club could look to bring in a veteran such as Erick Aybar or Alexei Ramirez to push Hechavarria and step in as needed elsewhere. A move to bring back defensive specialist Jeff Mathis as the reserve receiver wouldn’t be surprising, and there are a wide variety of other veteran backup types available. That brings us to a player who is perhaps the biggest wild card on the Marlins’ roster: left-handed-hitting infielder/outfielder Derek Dietrich. Though he fell off after a big start to the year and is much better against right-handed pitching, Dietrich’s overall offensive performance has been plenty promising. Dating back to the start of 2015, he has posted a .270/.362/.438 batting line with 17 home runs over 701 plate appearances. Better still, defensive metrics have come around on him, rating him as an approximately average defender at second, third, and (briefly) the corner outfield in 2016. It’s possible that the Marlins will find it hard to maximize Dietrich’s value with their current roster. He can’t play short or center. Second and third are largely occupied. And Dietrich won’t be of much utility at first since he swings from the same side of the plate as Bour. As the Marlins look to build out their depleted rotation, then, Dietrich could be a key asset. Certainly, he could be traded if there’s another organization willing to give up a useful arm to add him — though with such limitations in his game, trade partners would likely also be looking for some of the above-mentioned pitching prospects to give up a quality starter. More intriguingly, perhaps, the Marlins could explore the possibility of moving one of their young outfielders — Ozuna seems most likely, though Yelich could also be considered — to add an impact arm. In that scenario, Dietrich could pair with a righty bat in left field. Just what does Miami need in the rotation? Three spots are clearly accounted for, with the inconsistent-but-talented Adam Conley, steady-but-unspectacular Tom Koehler, and veteran Wei-Yin Chen (who’s looking to make amends for a miserable first year with the team) all more or less locked in. Righty David Phelps certainly made his case late in the year, turning in five outstanding starts after breaking out in the pen earlier in the year. He will have a prominent job of some kind in 2017, and the club seems to have quite a lot to gain by stretching him out next spring. And there are some possibilities for a fifth arm, including Justin Nicolino (who managed just 3.8 K/9 last year), Jose Urena (a low-K pitcher who has had good results in the minors), Jake Esch, Kendry Flores (if he can return to health), and perhaps Jarlin Garcia. You could squint at that group and see a complete staff, but the Marlins obviously aren’t content. The real question at this point is just how big they’ll look to go in adding another starter (if not two). Miami is reportedly willing to consider moving Ozuna, Gordon, Hechavarria, or Dietrich — but not Stanton, Yelich, or Realmuto — to facilitate the addition of an arm. Ozuna likely has the most appeal after a strong 2016 season, and the Marlins have indicated a willingness to move him in the past. Garrett, an exciting power lefty, is the real prize in the prospect pool and would surely draw significant interest. Even if Miami doesn’t gun for the biggest names (Chris Sale, Jose Quintana, Chris Archer) that could be available, rival teams with quality, controllable arms — think Jake Odorizzi — will have high asking prices. If the Marlins can’t stomach the sticker shock, it’s conceivable that they could take on part of a veteran’s deal, perhaps even becoming the third team to own a part of James Shields’s contract. They could also look to take a shot at adding a bounceback arm in the mold of Jaime Garcia of the Cardinals, or aim somewhat higher for his teammate Michael Wacha. In recent years, the Fish have shown a predilection for taking some risks in trades for young-ish, higher-upside starters (e.g., Cosart, Cashner, Mat Latos), so a reasonably bold move could be in the offing. Free agency isn’t without its options in the rotation department. While the premium talent just isn’t there, that’s not typically where Miami goes shopping anyway. A play for the best-available arms — Rich Hill, Jeremy Hellickson, and Ivan Nova — can’t be ruled out, but doesn’t seem particularly likely. They could seek some functional innings from a pitcher in the mold of Doug Fister, Jorge De La Rosa, Charlie Morton, or (for a budget option) Tommy Milone, though it’s fair to wonder whether that’s really what the team needs. A calculated gamble on Cashner would make quite a bit of sense — were it not for the fact that he struggled badly in Miami (and really doesn’t like its no-beard policy). Edinson Volquez is a workhorse who still has pretty good velocity, so he’d look to be a reasonable fit. Assuming that Phelps remains in the rotation, the top two pen options will remain A.J. Ramos and Kyle Barraclough. Recent trade addition Hunter Cervenka looks to be the primary southpaw set-up man, but he’ll likely be joined by another lefty. A new deal with Mike Dunn could make sense. Nick Wittgren probably has a job secured after a strong season. Brian Ellington has posted a sub-3.00 ERA in each of the last two years, and could take a job even if his peripherals don’t quite support the results. There are a variety of other internal options, including some of the youngsters noted above who are being developed as starters, but there’s plenty of room for improvement and good reason to think the Fish will look to add one or two useful veteran righties. Dustin McGowan had a successful season and could return, and the free agent market contains a wide variety of veteran performers with late-inning experience (including Sergio Romo, Joaquin Benoit, Santiago Casilla, and the hard-throwing Daniel Hudson). All told, there’s quite a bit of variability for the Marlins this winter, especially if they go hunting for a high-quality rotation piece. What does seem clear is that the organization won’t stop trying to contend. The team dealt some intriguing assets for Cashner despite a mediocre postseason outlook. And even after the disheartening loss of Fernandez, Miami struck a new deal with the veteran Prado. While it’s probably optimistic to expect a division title even with a fairly aggressive offseason, the Marlins could certainly profile as a solid Wild Card contender if they manage to bolster the pitching staff and make a few good calls on role players. It’s possible the D’backs have already interviewed most of their candidates, Piecoro writes. Those include Red Sox bench coach Torey Lovullo (who is perceived to be the favorite), broadcaster and former big-leaguer Alex Cora, Royals bench coach Don Wakamatsu and Triple-A manager Phil Nevin, whose candidacies have been noted elsewhere. Piecoro also adds a new name: that of Cardinals bench coach David Bell. Before taking his current position, Bell had previously served as an assistant hitting coach with the Cardinals, a third base coach with the Cubs and a minor-league manager with the Reds. Piecoro confirms that pro scouting director Mike Russell has left the organization to take a job with the Tigers, for whom he worked from 2012 through 2014. Robert Murray of Today’s Knuckleball had previously reported Russell’s departure. Of Ed Lewis, the former veterinarian who until recently headed the Diamondbacks analytics department, Hazen says, “I feel like there are just going to be some avenues that we want to explore on that side of the game that maybe bringing in people who are a little more specialized in certain things and maybe rebuild the department in a different way.” Lewis recently left the organization in the wake of recent changes to its front office. MLB’s collective bargaining agreement expires December 1, and both MLB commissioner Rob Manfred and MLBPA head Tony Clark have expressed optimism that two parties can avoid a work stoppage. While Manfred had previously said he hoped to have a new deal in place by the end of the postseason, though, Joel Sherman of the New York Post reports that he hears there is still work to be done, even on the day of what could be the clinching game of the World Series. It is possible, Sherman writes, that rules from the previous CBA could be “rolled over for at least this offseason.” A rollover of the current rules could potentially keep this winter’s free agent market from stalling by allowing free agents to negotiate with teams without either party worrying about how a new agreement might affect them. Sherman writes that, under the changes being considered, teams losing good free agents would still receive compensation. It remains to be seen what form that compensation would take, although it’s worth noting that, under the previous system, a team that offered a Type B free agent arbitration before his departure received a draft pick, without the signing team having to give up anything. Perhaps MLB and the MLBPA will consider reinstituting a similar system for a certain class of free agents.